Tim Berners-Lee has brushed-off unprepared American commentators telling their audience to 'Google him' during his role at the Olympic Opening Ceremony. The British national treasure and inventor of the internet appeared briefly appeared during the Danny Boyle-directed London 2012 curtain-raiser, to usher in the 'digital age' portion of the programme. He was shown sitting at a computer before sending the message "This is for everyone," which appeared on seats around the stadium and was meant to apply to both the Olympics and the his creation - the world wide web. However, despite that quite notorious distinction, during his time on screen NBC commentator Meredith Viera said: "If you haven't heard of him, we haven't either," prompting widespread eye-rolling from some Brits. Viera's broadcast colleague Matt Lauer ironically added, "Google him." Cue more eye-rolling. However, TBL says he wasn't offended by the slight and told CNN: "I am terrible at remembering people and places myself, so I can't really blame anyone for that." 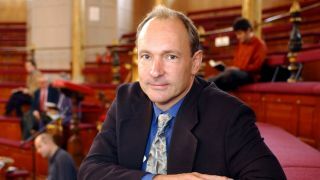 Elsewhere in the interview Berners-Lee, born and raised in London said his invention was a source of pride for the UK, free from government control. He said: "(The internet is) "one of the many things in the show that Britain can be proud of - and an essential thing of it was that it was an open thing, it wasn't something that could be controlled by any one government. "I was honored to be asked but it was also amazing to be part of this huge piece of amateur drama with thousands of people on stage."